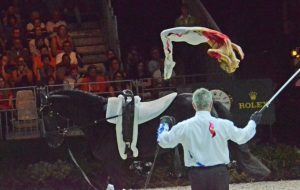 The equestrian sport of vaulting could be described as gymnastics using a horse as a mobile platform. The horse is lunged in canter on a circle no smaller than 15 meters diameter, while the athlete performs gymnastic movements on top. British vaulting is celebrating the recent success of Britain’s Joanne Eccles at the Alltech FEI World Equestrian Games. Joanne won gold in the individual female class in Normandy. The Eccles sisters (Joanne and Hannah) took bronze in the pas de deux class. Vaulting also has classes for individual male competitors and a squad class, in which a group of seven athletes perform together with up to three individuals on the horse at any one time.